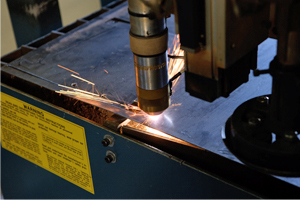 Danforth’s state-of-the-art Sheet Metal Fabrication Shop and skilled workforce is capable of manufacturing and installing a wide array of fabricated sheet metal products. Our Sheet Metal Team is equipped to produce high quality metal products from light gauge HVAC ductwork to heavy gauge industrial duct systems. We offer standard spiral and rectangular duct as well as custom applications to meet the needs of our customers. Our Sheet Metal Fabrication facilities in Western New York, allow us to provide cutting, bending, welding, and machining services for all types of metal including galvanized, stainless steel, aluminum or any other sheet metal or light iron. Using computerized scheduling and statistical process control we put the industry’s most advanced machinery to work to manufacture the highest quality products. We are committed to meeting all SMACNA Sheet Metal Fabrication standards for ductwork, forming and fabrication. Danforth is unique to our competition because we self perform most of our work. Our Sheet Metal Fabrication Shop is a testament to this. We build, transport and install the duct ourselves which makes it easier for our customers to coordinate their efforts with a single source provider. Coupled with our Management Team and highly skilled workforce, Danforth can offer outstanding quality sheet metal products and ensure proper installation to maximize effectiveness and project success. We maintain our shops in a constant state of readiness to handle any size job. Our self performance model allows our clients to reduce costs because we offer a single layered markup structure. Other contractors markup their labor, and then purchase materials from outside sources, adding an additional mark up. This increases project cost while adding no corresponding benefit the client. Start Your Sheet Metal Fabrication Project with Danforth. Meet with one of our Sheet Metal Fabrication consultants. We’ll outline our process and begin your project estimate. Need More information? Send us a quick message and we’ll reach out to you to help plan your next Sheet Metal Fabrication project. Get answers about our Sheet Metal Fabrication services and speak with a knowledgeable Sheet Metal Fabrication Expert.